Since the documentary came out about Rick Simpson Oil, we’ve been getting a lot of phone calls from people who want to know what it is, how it’s made, and what it’s for. Next, people want to know how to make Rick Simpson Oil themselves. Sometimes people call this hemp oil, but that is a broad term that is often misused when referring to THC and CBD Oil. In this article, we’ll cover the right marijuana starting material to use, the right solvent to use, the right equipment to use, the proper process to follow and lastly, how to test the end result. When we’re finished here you should know how to make Rick Simpson Oil as well as how to spot good and bad quality oils in dispensaries. Rick Simpson is a guy from Canada who’s story tells that he cured his own cancer using a very specific method of making an oil concentrate from the cannabis plant. He recommends ingesting 60 grams of the oil orally for a period of 90 days depending on the condition you are treating. A full gram of the oil per day is the goal Rick recommends to achieve the most healing benefits. You can see his documentary here or there’s even a whole book about the guy Rick Simpson Oil – Nature’s Answer for Cancer . We quickly discovered that most of the oil concentrates available, while they will get you stoned, are not made according to the specifications outlined in the Rick Simpson documentary for use as a cancer treatment. Let’s go further. Most of the oil concentrates on the market look like the oil pictured in the injector. Notice it plainly displays the weight of the product at “~.5 grams”. Well, that’s great, but all that tells us is that it weighs about a half gram (approximately). A small kitchen scale can tell us the exact weight of the oil quite easily, so I’m not sure why they included an approximate weight. Still, products like these are found in dispensaries everywhere. Even worse, the staff at dispensaries is usually unable to properly advise on these types of products because they are uneducated on the matter. What’s missing is a lab test report that shows the content of the active cannabinoids (ingredients in marijuana such as THC, CBD, etc.) inside. Also, what type of material was used to make this oil? 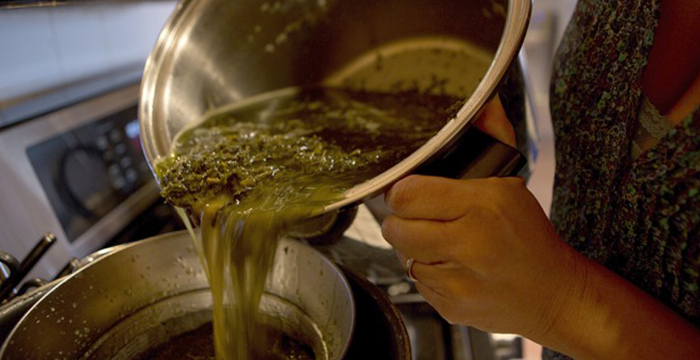 Most oil concentrates are made with shake, leaves, and leftover plant matter after the buds have been harvested which leads to poor quality oil. Read further on the types and quality of oils in our THC and CBD Oil Buyer’s Guide article. The oil in the photo is not the level of quality that people who use the oil for things like cancer treatment and serious illnesses prefer. Take note of the $35 price on the oil in the photo. Later in this article, we’ll go over why the price of the oil in the photo also indicates this is not a quality Rick Simpson Oil. Next, lets go over the first quality control step in learning how to make Rick Simpson Oil. Learning how to make Rick Simpson Oil? Start with full size marijuana flowers or buds for the best result. Rick’s method firmly states that you must use 100% premium marijuana flowers, or buds. The proper way to make the oil is by following Rick’s method, exactly as he shows us in the documentary. Only use premium quality, organically grown marijuana flowers which are the full size buds. Shake, sticks, stems, or trim is not sufficient for medicinal use as they do not contain the medicinal properties found in the buds. Careful when buying oil at dispensaries, you will see oil that looks like Rick Simpson oil but is actually made from marijuana leaves and trim. When lab tested this oil only results in a 30-40% potency of THC or CBD. A proper Rick Simpson Oil made using his exact formula should result in a minimum of 70% potency, even up to 90% if made well. Trim or shake from the leaves is very cheap, usually around $100-$200 per pound. A full pound of premium marijuana flowers or buds can range from $2000-$3000 which results in a costly end product. When you use actual flowers as the input for Rick Simpson oil the yield is much greater than if made with leaves or trim. Expect approximately 60 grams of oil on average if using premium quality flowers. If made with leaves or trim the yield will be dramatically reduced and the oil will be much thicker and clumpier due to a higher concentration of fats and waxes extracted from those parts of the plant. The first step in learning how to make Rick Simpson Oil is to take those precious flowers that you’ve been protecting like your first born child for over 90 days, if you grew them yourself, and grind them up. Just a medium grind will do. Aim for the consistency of a fluffy saw dust. If you end up with dusty powder, you’ve ground too much. The goal is simply to expose the inner parts of the flowers to the liquid used to extract the oils from the plant. Makers of Rick Simpson Oil will argue about this all day long, but we believe the answer is simple. Most use Everclear as a solvent solution to extract the oils from the ground flower and that’s fine. Others will argue that you should use a much higher proof alcohol because Everclear and other similar alcohols have a lower proof and contain more water. Some people have even used isopropyl alcohol because it is 99.9% concentrated. Our opinion is that you should choose an organic alcohol with a proof of 150-190, which you can find from various suppliers online and disregard the argument that a higher proof is better. During the extraction the temperature is raised to over 240 degrees F which dispels any water from the oil extraction. Rick Simpson even recommends in his video to squirt a few drops of water in your extraction to help quickly spike the temperature up a little higher, so don’t fret if you can’t get the highest proof alcohol on the planet. It will work just fine. The rule of thumb is approximately 1 gallon of alcohol per pound of dry flower material should be sufficient in absorbing the oils off of the plant. Some will even recommend using another gallon of alcohol to re-saturate the same flower material and rinse it for a second time. This results in a greater total yield, but the quality of the oil will be darker and slightly clumpier because on the second round the alcohol starts extracting more of the chlorophyll, waxes and fats from the flowers. If you just do one rinse of the flower material you will yield approximately 40-50 grams of oil. If you do the second rinse you will yield approximately 50-70 grams of oil. It really varies a lot due to the quality of the starting material. If you want to work with smaller quantities of starting material first, rather than risking it on a $2500 pound of flower, that would be advisable. Just reduce the recipe in half or even one quarter. Dehydrate the flower material at 130 degrees F to remove as much unwanted moisture as possible. Next, toss your alcohol solvent right in the freezer as well. Freeze it for a week if you can. Once both your dry material and alcohol are frozen, now the material can be soaked or washed it is often called. Clean out the freezer and leave plenty of room so you can actually leave the flower material and alcohol inside the freezer after you soak it in the alcohol. If you have a subzero freezer, that would be most ideal. Take the frozen alcohol and saturate the flower material in a convenient mixing bowl with high sides that won’t splash all over as you stir it. Stir with a spatula for approximately 5-10 minutes. The longer you let it sit, the darker and clumpier the end result will be. If you only let it sit for 5 minutes, you’ll notice a smaller total yield but a more clear brown color to the oil. The mixture should stay frozen the entire time. Once you have it good and stirred up, close the freezer door and let the alcohol continue to absorb the oils from the flower material. Remember the colder the better. Experiment with a few different soak times on small test batches and look for the difference in clarity in the oil. After your desired soak time, use a colander with small holes/slits in it to quickly strain back all the dry flower material and let the green alcohol solution slip through into another glass container with high sides so it won’t splash. You can use any kind of glass bowl or container as you see fit according to your freezer space. Sometimes you have to get really creative, but that’s the fun part. At this stage you can choose to do a second soaking of the plant material using a second gallon of alcohol if you prepared that as. If you decide to do a second soaking you have two options. You can either combine the two alcohol solutions back together in one container or keep them separate from each other and finish the extraction separately to notice the quality difference produced as a result of the two different soaks. Whichever you choose, keep the alcohol solutions as cold as possible and once you have strained back the plant material and massaged it with a spatula until all the alcohol solution has dripped out, go ahead and toss it out. Seal off your containers with the green alcohol solution from the freezer moisture using saran wrap or seal top lids if you have a container with those and let them rest in the freezer for another 48 hours. You’ll be so fascinated you wont want to stop but this is a critical step and now we’ll finally learn why. Letting the solution freeze down as low as possible freezes all the undesirables in the solution such as plant fats, waxes and and pesky water than leached into our extraction solution. The desirables, which are the alcohol and the absorbed oils, stay in a liquid state. This allows us to then filter the solution with an even finer filter and clean the oil of its gunky fats and waxes. Think like ice cubes in a glass of water. It’s easy to filter the ice cubes out of the water if they are frozen solid. Once the ice cubes melt, it’s not really possible to filter them out any more. This is why its critical to keep this solution frozen. If you have the time, let it freeze for 36 hours or longer so you know its frozen good. Now, we’re ready to use that vacuum filtration kit. Looks complicated but here is a simple video that explains how to use it. This step, most importantly, should be done in the freezer as well because this is the actual point where all that freezing time comes into play. Set up your filtration system in the freezer if it will fit. You may have to tilt it on an angle, buy a taller freezer, cut a whole in the top of your freezer (just kidding, don’t do that) or get creative to make it work. Worst case, if it will not fit, just do this step when it is coldest out so your temperature doesn’t fall too much. Drop in your Whatman 6 micron filter papers (the little round white discs) and start filtering the frozen solution. Soon, you’ll start to notice what is called ‘filter cake’. A little pancake of plant fats and waxes will build up on top of the filter paper disc. Soon it will clog completely and the green solution will stop coming through the filter paper. Peel it off, throw it away, and drop in another filter paper since they come 100 in a pack. Repeat this filtration process until all the extraction solution has dripped through the filter paper cleaning up the oil. Feel free to repeat this step as many times as you like to further purify your oil. Eventually the filter cake will not appear anymore and you have done a pretty good job at filtering the oil. The better you get at this step, the more potent your oil will become. Now you are ready to reduce the extraction to remove the alcohol and leave only the purified oil extraction. Think of it like reducing a red wine reduction. There are many ways to do this and whatever method you prefer is fine there is just one important detail that cannot be missed. The oil extraction must be properly heated to over 240 degrees F. This changes the oil form from an acid to an active ingredient. Without proper activation of the oil by heating to over 240 degrees F, the oil will not have the same effect and not much of anything will be felt. Certainly, many believe the acid form has some anti-inflammatory properties and other benefits but speaking about how to make Rick Simpson Oil means the oil should be heat activated. Take the extraction solution and pour it into the rice cooker, turn it on and wait. You will probably not be able to fit all the solution in the rice cooker in one fill. That’s ok, just refill the rice cooker with more of the solution when it gets down to about half way full. The reduction process will slowly simmer for about 3 hours depending on how much alcohol you used. During this time use the infrared thermometer gun to monitor the temperature of the solution. At no time should it ever go over 300 degrees F. If the temperature goes that high, you will risk burning valuable cannabinoids which begin becoming volatile at temperatures that high. Once all the solution has reduced down to a thicker, more concentrated solution, it’s time to finish the extraction. Most how to make Rick Simpson Oil videos will tell you to leave the solution in the rice cooker until it reaches a temperature of 275-300 degrees F, at which point all of the alcohol, which boils at about 173 degrees F, has evaporated out. The problem with this piece of advice is that you are at the mercy of a cheap little rice cooker that has poor temperature control over our precious oil. When the temperature spikes, and it will at the end, you must be there monitoring every second with the laser infrared thermometer to verify the temperature is exactly where it should be. It’s a bit of a circus act that can be avoided with one simple step. Instead, once you have monitored the temperature of the oil up to a temperature of 220-240 degrees F, remove the oil from the heat and pour it into a glass pyrex pan that is oven safe. Now, all of the alcohol has been removed in an outside ventilated environment and you can pop your pyrex pan of oil into the oven for more precise temperature control without the risk of burning the oil due to a rice cooker with a mind of its own. Rick recommends adding water to the solution in the final stages of the rice cooker reduction but that isn’t necessary if you use the oven method to finish the oil. Set the oven at a precise 275 degrees F and go reward yourself with a frosty beverage. Stir the solution around a little throughout the time in the oven. You’ll see little bubbles floating out of the solution as the alcohol finishes evaporating every last drop. Stick your laser infrared thermometer in the oven about 45 minutes later and verify the oil has reached our target temperature of 275 degrees F. Continue stirring the solution until all the bubbles have popped and the oil has a smooth, glass-like texture.This process can take up to 12 hours, depending on the strain and the amounts of solvent used. A careful eye is really the key to a successful batch of Rick Simpson Oil Concentrate. Congratulations you have learned how to make Rick Simpson Oil on your own. Here you can see a progression of three different lab test results that can be achieved with the methods we have discussed. You can find a local laboratory to test your oils for around $50 generally. The more emphasis you put on the quality of the starting material and the temperature of the extraction throughout all phases of the process, the better your test results will be. How to make Rick Simpson Oil. A progression of 3 lab tests showing the potencies you can achieve.